We here at BBC Sport hope we at least kept you entertained and thank you for sending us your tweets and messages. You kept a late night humorous as you always seem to do. How will he be remembered when retirement soon comes? The man who headlined an over-hyped disappointment? The greatest of all time? You guys decide, but for now, get some sleep. 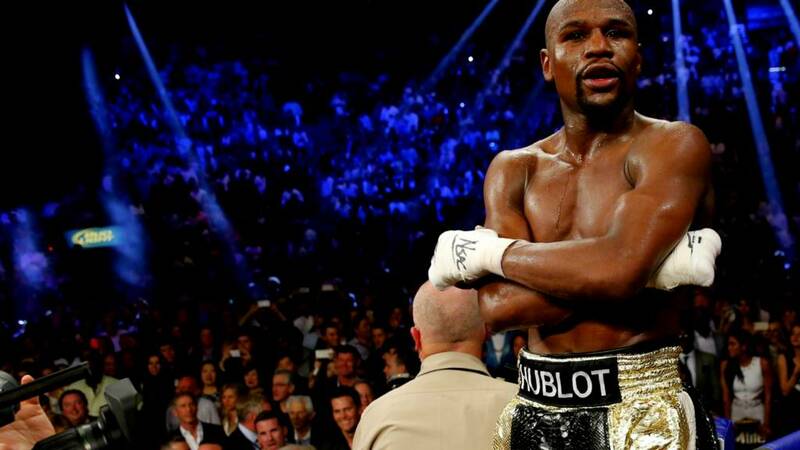 What now for Mayweather? What now for Pacquiao? What now for boxing? All three will have questions to answer. Retirement queries for the fighters, an inevitable entertainment-value probe for the sport's governing bodies. It is perhaps fitting that a fight which will divide opinion on it's entertainment value is taken, convincingly, by a man who has spent 19 years dividing opinion with each of his 48 fights. But even the strongest of views can surely not deny the brilliance of the complex character inside the ropes. Floyd Mayweather's footwork was at home on the sport's grandest stage, his awareness superb, and his educated strikes were timed to perfection. He was, quite simply, too good. That's around 34% of punches landed by the winner, Pacquiao only hit the target with 19%. Money Man relied on the jab, chucking 267 Pacquiao's way, landing a quarter of them. "Floyd Maywather is a genius. People will realise. Those here should hold onto their ticket stubs because they can say they saw one of sport's all-time greats." Asked for the reason Floyd Mayweather is unbeatable, former world heavyweight champion Mike Tyson tells Sky Sports: "It's him. It's who he is. It's just his time at the moment." Not what it should have been? Lightweight boxer Anthony Crolla on BBC Radio 5 live: "Once they get in there and realise how hard it is to hit Floyd Mayweather, it just breaks their heart." Jon Salinger: Can they please change the rules of boxing where you actually have to punch to win a fight? Declan W: Frustrating fight. Mayweather seems to have found the flaw in the Matrix that allows him to win no matter what! Henry Withrington: I had it 117-111. Safe to say there is no need for a rematch. "I will put it to you that Manny Pacquiao has not lost rounds like he lost some of those rounds since he turned pro." "What happens in Manny's corner is his childhood friend, who he used to sleep in cardboard boxes with, translates Freddie Roach's views, so it loses urgency. "You have to accept if you share the ring with Floyd Mayweather, four out of every five punches are going to miss. It hurts." Manny Pacquiao tells fans at the MGM Grand he thinks he won the fight: "It's a good fight, I thought I won. He didn't do nothing, just moved outside. "I got him many times. I think I won the fight. He is moving around and it's not easy to throw a lot of punches if your opponent moves around. I can handle his power, it's not strong like other opponents. It's not about size. I've been fighting bigger than him and it's not a problem." It's safe to say faces are glum in the corner of Team Pacquiao. The walk back to the changing room will be lonely, the dressing room quiet but the frustration will be deafening in the mind of Manny Pacquiao. "Manny lost the fight, and he lost his way. He seemed to run out of ideas." Floyd Mayweather speaks from inside the ring: "I want to thank God for this victory. I want to thank all the fans that came and those around the world. He's a hell of a fighter. Now I see why he is one of the guys at the pinnacle of the sport of boxing. "I knew he was going to push me. He had moments in the fight but I kept him on the outside, I was a smart fighter I out-boxed him. We did what we had to do tonight, I'm truly blessed. "I calculate the fighter. He's a tough competitor. My dad wanted me to do more but I had to take my time and watch Manny very close. "When the history books are written, it was worth the wait. My last fight is in September and then it's time for me to hang it up." Floyd Mayweather has fought 48 times and won 48 times. "And still undefffeeeattteed," cries the announcer. Floyd Mayweather wins on a unanimous points decision. It's scored 118-110, 116-112, 116-112. Three judges will call boxing's biggest night. Mayweather is up on the ropes again. Pantomime. Manny Pacquiao's face is now one of defeat. Here we go, judges verdict coming. Manny Pacquiao raised his hands to the air on the bell. That has to be hope rather than belief. There is an energy in the Mayweather corner, father and son embrace. Pacquiao's corner is far more subdued. We await the decision. Up on the ropes Mayweather gets to celebrate, boos are fired his way. "They can't beat me", he says as he steps down. "Mayweather was the favourite and boxed like a favourite." Floyd Mayweather knows how to impress the judges and his low hands are those of a showman. As Pacquiao comes in, Mayweather counters with a right. The pair clinch, Pacquiao has barely been able to engage in a clinch all night. A minute left, Mayweather is showing off, dancing left, right, back left, he's like a slalom skier. Mayweather lifts his fist to the air as we get close to the bell, no punches of note landing. There's the bell. Boxing's greatest show is over. This is it. The final three minutes. What have you got Manny? It has to be big. "If this is Mayweather in decline, then I'd like to see him at this best. This is turning into a brilliant display by him. I've got it 7-4 to Mayweather." Round 11 opens with an immediate straight right from Mayweather to the face of Pacquiao, a shot of encouragement and the American wants to follow that one up with a hook but it's ducked. The confidence is oozing. He knows he is closing in on greatness. Gets in close, upper-cut lands. You could hear that one. This is now becoming a bit of a schooling. Jab from Mayweather, walks forward, jab again. There is only one man - a defensive genius - landing. He briefly gets cornered and the blurry hands of Pacquiao release but there's no one home. It's stick or twist time for Manny. He is going to have to start diving in. The bounce in Mayweather's jump is getting higher, the guy is at ease here. "Manny knows. He's not stupid, he's disappointed. Manny needs a knockout, and that would be a fluke shot." Now is the time Manny. You have nine minutes to fix up a fight you're losing, a fight you will always be remembered for. The Filipino walks his man into a corner. A flurry follows but again it's ducked and eluded. He must be feeling the frustration. Pacquiao dives in, two-shot combo, the second with the left caught his man. Better stuff but again he is sent packing with nothing much to show for it. Mayweather is the gatekeeper to his own brilliant defence and he ain't giving no key up easily here. Pacquiao just cannot get into that pocket of space to land anything powerful. The effort is there, the energy not what it once was and he goes back to his corner smiling. That has to be a smile of frustration. "We have Mayweather leading 6-3. It's quiet now as the crowd favourite Pacquiao tries to gain momentum." "I'm giving that round to Manny Pacquiao. I found that round extremely odd. I'm wondering whether Mayweather was trying to tee him up for a stoppage and that might be because he's getting tired." "Be careful with the elbows", referee Kenny Bayless tells the Mayweather corner. Mayweather's feet are floaty as he skips, ducks and does what he needs to do, felt that one though, a straight left from Pacquiao caught him in the kisser. No lasting damage. Pacquiao gets his man backed up to the ropes but as he draws his right he gets one in the middle of his face for merely thinking about landing a punch. He cannot get inside. Will he need to get reckless? Another slick counter from Mayweather, it's a left hand. No doubt again, Mayweather's round. Dominant, classy, unbeatable? "Back him up," yells Floyd Mayweather Snr as his son leaves the corner for round nine. "Floyd Mayweather walked nonchalently backed to his corner there." A swinging right from Pacquiao is wild and gets nothing but he lands a juicy one in the centre of the ring. Mayweather curls up like a ball to take it and absorb any follow up - none arrives. "Manny, Manny," chant the crowd. They want a bit more from their man. My word this is tense. Mayweather leans back out of range and counters with a straight right. A very good shot. He is just doing enough time after time. Left hook from Mayweather is slappy. An almost arrogant shot, he slapped around the defence of Pacquiao. That's given him some confidence, his hands are low. Two steps forward from Pacquiao, two steps back from Mayweather. He assumed control of that round halfway through and didn't relinquish. "On our cards, Mayweather won the last three rounds and is leading 5-2." Some Body: Hope this is over quick because I need to get to bed! Matthew R Wallis: Pacquiao is a man on a mission! He got that round! But will he get dropped to the canvas in the next couple of rounds? John Lee: A better round by the Pacman . "I thought that was quite a big Floyd Mayweather round. It was one minute, 41 seconds in before Pacquiao got his act together in that round." We are past halfway in arguably the biggest fight the sport has seen. The heavy blows are yet to land and round seven is no different. Mayweather has set up camp behind his jab. That left hand rises from his body from nowhere but BANG, a two-punch combination from Pacquiao looks busy and glances his man. It didn't fully connect. That's as good as it gets for him in seven. Nothing in the round. Good luck calling that one. "Manny is quite severely marked up under the right eye, that's from the jab. They are getting a bit reckless, and I like that." Floyd Mayweather Snr tells his son in the corner: "I don't know what the hell is wrong with you man." A wake up call or genuine concern? Pacquiao has to up the pace, he's being played by his opponent here. He starts round six energetically, that's the stuff he needs but a clinch sees referee Kenny Bayless yell "keep it clean". Back comes Pacquiao, he lets a few go with Mayweather again confident near the ropes. Three cross shots get the crowd roaring. They know he is up against it and has work to do. These punches don't look measured from Pac Man but they at least show willing and he will take that round. Again, not a lot in it but the increased intensity is working for him. Can he sustain it? We are halfway, I'd say 4-2 Mayweather. Don't forget, the Money Man has the reach advantage here. Pacquiao has to work to get into range and is finding it hard work. "If I'm in Floyd Mayweather's corner now, I'm saying if Pacquiao keeps backing off, he'll get trapped in. I've got it 3-2 to Mayweather." Floyd will know that last round was far from his own, what has he got in response? You can feel the respect between the two. A chess match? I'll throw when you throw. Make your move. A quiet opening minute to round five, forward comes Mayweather at speed, he thrusts himself onto Pacquiao with three shots but they barely landed. Shuffle, shuffle, Mayweather darts out of range, then a left jab and another, neither land. Pacquiao feints, will he throw? No. Lateral movement and Mayweather is out of range. Great boxing, technically brilliant from the showman. This will be his round. Nothing devastating, just too good. "That was the best round of the contest so far for Manny Pacquiao. Mayweather was under pressure. How will he respond? On our scorecard now, it's two rounds apiece. It couldn't be closer." The speed of Mayweather under attack is absolutely incredible. Even against the ropes he just ducks low so he can't be punched on the back of the head. It's a brave style, he puts himself in the firing line but has every confidence of getting out of it. But hang on, what is happening here? Pac Man has his man backed up and sweating. Four shots, wallops too and the roars are deafening. This is more like it from the Filipino. His opponent had no choice but to get a guard up and take some punishment there. Hearts were racing, the world gasped. Pacquiao smiles on his way back to his corner. We have a fight! "The crowd are willing Pacquiao on here. They are so partisan. If they could get in the ring with him they would." Manny Pacquiao rolls his shoulder, he looks for an angle, can he get in? Not quite, he throws himself into range but can't get anywhere near this ballerina. Referee Kenny Bayless has to break the pair on the ropes. Is a tussle Pacquiao's only hope? Now he corners Mayweather but the head movement is blistering, allowing the WBA and WBC champ to avoid serious contact. The feinting is good from Mayweather, when under fire he springs back out of range. Dance, dance, dance. Round over. A nice right hand from Mayweather ends it. Not much in the three minutes but the elusive nature of Money Man is standing out. "Mayweather won it clearly and cleanly. What's worrying for Manny is to make sure he keeps his left hand up. He is going to get dropped"
There is almost a silence in the arena, such is the intrigue. Pacquiao is backing up his man to the ropes but the balance and defensive skill of Mayweather is as good as ever. In rushes Pacquiao, a big left body shot but it's well telegraphed by Money Man, he fields it. Mayweather is pawing him away and then bang, in dives the American sharply. A right hand and a stinger. He looks sharper early on, more aware, more alert and explosive. "That was Floyd Mayweather's round. It started to open up later on. The crowd are living and breathing every punch." Cagey opening, feel your way in, a couple of jabs from Mayweather. Then he tries to go to the body. In goes Pacquiao near the ropes but just as he realises he is in counter-punch territory he gets tagged, right hand, best shot of the early exchanges. The orthodox-southpaw stances sees their feet clash once. That's how close these men are. Another jab from Mayweather gets nothing but glove. He is just about nicking this round and a counter right hand will definitely see him take the edge after three minutes. He tempted Pacquiao in and caught him sweetly. It didn't rock Pac Man but he felt it. This is it. The bell goes. You waited for it. Enjoy it. Pinch yourself. Floyd Mayweather is fighting Manny Pacquiao. Referee Kenny Bayless tells the fighters this is the fight the world has waited for. "Touch them up and God bless." Off comes Manny Pacquiao's t-shirt, his introduction is done. Now it's the turn of Jimmy Lennon Jnr to intro the WBC and WBA welterweight champion - Floyd Mayweather. He says: "Here is the pound-for-pound great and pay-per-view king....introducing Floyd 'Monnneyyy' Mayweather." What theatre. Manny Pacquiao is still smiling. He throws a few air shots in his corner. Floyd Mayweather is wearing the ultimate poker face as Michael Buffer yells into his microphone... "let's get ready to rummmbblllllee". Robert De Niro, Ben Affleck, Clint Eastwood, John Voight, Justin Bieber, Evander Holyfield, Sting, Tom Brady, Bradley Cooper. The list of A-list names sat near in the MGM is never ending. "Not just boos but a crescendo of hostility for Floyd Mayweather. There's none of the smiling we saw from Manny Pacquiao. For so long Mayweather has been the villain on big nights like this, but he has the ability to cope." A fight of contrasts and ring walks of contrasts. Floyd Mayweather give us a smile... no chance. He is draped in a zip-heavy jacket. It's shiny, black and white with gold sleeves. A few boos. The lights race around the arena, you can feel the electricity. Into the ring, a jog around, he has seen this place before. This is game-face stuff from Floyd. Pacquiao hasn't stopped bobbing on his way to the ring, he stretches his hands out to tap the palms of hands desperate to touch him. He goes to the corner of the ring, down to his knees. Time for prayer. And here comes Manny Pacquiao. Did you know that who got to enter the ring last was a bone of contention when this fight was being made? Pac Man is the first through the corridors. He has a white headband on, a white t-shirt and he is bouncing on his toes. Red gloves, he smiles and lifts his hands in the air. What a moment this is... and Freddie Roach, his trainer, stops his charge and takes a selfie as they walk towards the curtain. Ricky Hatton is ringside. He lasted 10 rounds with Floyd Mayweather in 2008 but less than two when Manny Pacquiao threw one of the most devastating hooks in recent memory his way five months later. Despite feeling the full force of Pacquiao's power and speed, the Hitman does not think the Filipino will have enough to claim this Las Vegas showdown. "Pacquiao has all the attributes to beat Mayweather - if anyone is going to beat Mayweather it will be someone with similar hand speed who is a southpaw. Pacquiao will definitely cause problems, it will be Mayweather's toughest task yet. "But after a few rounds, Mayweather will do what he does best and suss things out. He always manages to adapt his style for the opponent he's facing and always finds a way to win. Love him or loathe him, he's a genius. I'm picking Mayweather to win on points." I'll sit on the fence and give Jamie Foxx's national anthem effort a six out of 10. Let's hope that isn't the part of the night we remember. This feels big now. "We are ready for the main event of the evening", says Jimmy Lennon Jnr. "The wait s over, it's showwwwtime." The national anthem of the Philippines is sung by a small contingent of softly-voiced singers in the corner of the advert-covered ring. Now it's time of Hollywood actor and singer Jamie Foxx to let rip on the American anthem. He has a white suit on, that's surely ramped up the pressure on him. Here we go... "Oh say can't you see..."
Go on, say it. I know you want to. "LET'S GET READY TO RUMBLE". Did you know that after eight years of using his famous catchphrase, Buffer took out a trademark on it which has reportedly netted him over $400m (£268m)? Let's get ready to coin it in, eh Michael? While Floyd Mayweather and Manny Pacquiao have been viewed as Emperors, heavenly figures and heroes in recent weeks, both men have moments in their past they will be far from proud of. claimed on Saturday their attendance at tonight's fight had been blocked by camp-Mayweather due to their reporting on his history of domestic violence against women. But Pacquiao has a dark side. He has admitted to adultery in the past and in 2013 his assets were frozen in the Philippines after it was alleged he owed $50m in taxes. Floyd Mayweather has hands which need care and seemingly feet which need TLC too. Twitter image, he's happy to get his dancing feet out, dip them in a tub full of fish who will clean up the dead skin. Maybe his feet are worn out. He did make it to week four of Dancing with the Stars (America's version of Strictly Come Dancing) in 2007. How are you taking in the fight? AP McCoy, the recently retired 20-time champion jockey, tweets: "I can stay awake all night it's not like I've got a job to worry about #unemployed #MayweatherPacquaio"
How are you taking in the fight? Send us a picture on #bbcboxing. House of Pain's killer track 'Jump Around' is playing inside the MGM. It's belting out. Manny Pacquiao of old didn't half jump around. Can he do it again? Mayweather - elusive, floaty, a Grandmaster. Pacquiao - a wasp, aggressive, relentless. A look at the average number of punches these men throw in a round tells us much about their style. Money takes his time, picks his shots and throws an average 39.5 a round. Pac Man chucks them in for fun - 65.5. That's more than one every three seconds. What does this tell us? Pacquiao cannot be wasteful despite his work rate and must be accurate. Mayweather always is accurate and will likely wait for his chances to counter. Manny Pacquiao is just putting his gloves on. He's taking his time. Remember, Pacquiao is a southpaw. Why is that significant? It means he will lead with his right hand. That's his jabbing hand and the left becomes the power shot. Mayweather will be the reverse. This is key as shots come from angles a fighter like Mayweather will not be overly used to. It also means their feet are closer together on the canvas because of their opposing stance. Throw in the fact their heads are also closer together than when an orthodox fighter like Mayweather faces another orthodox and the potential for head clashes increases. Danny Clutterbuck: This is how I roll for Mayweather v Pacquiao. Breakfast rockstar. If boxers were football teams who would they be? Olympic medal-winning boxer Anthony Ogogo told BBC Sport Floyd Mayweather's style is similar to a Chelsea team. "His style is similar to a Mourinho team because he sets himself up not to lose," said Ogogo. "Winning is his number-one priority - if he looks good doing it then great but first and foremost he wants to win. "In footballing terms, Alex Ferguson's Manchester United team of the late 1990s are a direct opposite to Mourinho's Chelsea. "Fergie's teams won with attacking flair, all gung ho and exciting to watch. If I could liken any fighter to that United side then it would have to be Manny Pacquiao." Lightweight boxer Anthony Crolla on BBC Radio 5 live: "You couldn't meet a cooler guy but tonight for the first time I think Floyd Mayweather is going to be nervous." You can listen to Anthony Crolla on BBC Radio 5 live right now. "People are saying that both of them night take a risk. Some stuff I heard around Vegas, I just got a feeling they might buck the trend and we might see a fight early here." You can listen to Steve alongside commentator Mike Costello on BBC Radio 5 live right now. Which sports star would you never want to fight? Ravi Beeharry: Peter Crouch... It would be like fighting a giraffe. You wouldn't get one head shot in. Tweet us on #bbcboxing specifying which sports star you would never want to fight and tell us why. And it turns out this is no chance look. It's calculated and business like as our find is a DJ - DJ PacMan no less. BBC presenter Rico Hizon in the Philippines: "This is it! The moment of truth! The mega fight that all Filipinos young and old have been waiting for - sports icon Manny "Pacman" Pacquiao vs Floyd Mayweather! "As I roamed the city streets earlier, they were virtually empty as people watch from their homes, public town halls, stadiums, restaurants and bars this fight of the century. "Many of them in this predominantly Christian nation attended church services before the match praying and hoping that Manny will bring home the top prize. "A bank employee who I spoke with said that a victory by Manny will bring honour to the country. He's the Filipino's Pride!" Do you fancy yourself as a bit of a Pac Man? Do you have the blistering hand speed? The 36-year-old was recently filmed in training landing 126 punches on a bag in 30 seconds. That's over four punches per second raining down on the target. Give it a try this Sunday morning. How many can you throw in half a minute? Go on, say it with me: "Last night I cut the light of in the bedroom, flicked the switch was in bed before the room was dark." Ben Henshaw: Trawled the Vegas strip for a couple of hours and finally got CCTV tickets - BUZZIN!!! Can Khan get his chance? Penny for the thoughts of this man in the crowd. Floyd Mayweather has one more fight left on his TV contract after tonight. Amir Khan is watching on in what he hopes will be a scouting mission. Ryan Bachman: I had work 5am yesterday, still haven't slept - this fight better be worth it !! Peter Kimbidze: Heard a good talk with Snr. He promised to win. Manny with the family around! Watching him loose will be sad. But Floyd will win 11th round. Joe Gallagher, trainer of boxers including WBA super-bantamweight champion Scott Quigg, on BBC Radio 5 live: "Floyd has taken Manny very seriously and is in good shape. He wants the adulation that Pacquaio has." You can listen to Joe Gallagher and one of his fighters - Anthony Crolla - on BBC Radio 5 live right now. Manny Pacquiao has his hands wrapped, he ties his laces and gets up to see how the boots feel. The underdog looks relaxed as he makes some final adjustments. BBC reporter Rico Hizon shows. "Apparently - and inevitably - the Pay Per View is playing up in the States, which could delay the main event. By quite some time... If people don't get to see this fight because of a cable balls-up, we might have one hell of a scandal on our hands." Like the opening of a blockbuster film which wants to go one better than those listed in the current record books, this fight has a mark it needs to hit to go down in history too. If we look at the biggest HBO and Showtime productions of the last 27 years, the figure of 2.4m as a target becomes clear. 2.4m pay-per-view buys: Oscar De La Hoya vs. Floyd Mayweather, 5 May 2007. 2.2m pay-per-view buys: Floyd Mayweather vs. Saul Alvarez, 14 September 2013. 1.99m pay-per-view buys: Evander Holyfield vs. Mike Tyson II, 28 June 1997. 1.97m pay-per-view buys: Lennox Lewis vs. Mike Tyson, 8 June 2002. "Forget Formula 1, forget Wimbledon, forget World Championship rowing and running, all of them pale into insignificance when you get two of the greatest fighters in the world competing at the highest level. It's got to be good for the game." This fight is expected to break the world record for pay-per-view buys which currently stands at the 2.4m purchases when Floyd Mayweather met Oscar De La Hoya in 2007. Let's say for example it makes four million sales, well multiply that figure by the $100 price to televise the fight in American and there's $400m earned already. Fancy a $30 (£20) programme? I guess when you've paid thousands for a ticket what's a few more? Former world champion Sugar Ray Leonard and actors Ben Affleck and Bradley Cooper are the latest glitzy names in attendance at the MGM's Grand Garden. This has to be one of the most elite crowds ever assembled at a sporting event. "As soon as the first punch was landed, the fight was over." Freddie Roach. Be warned, Manny Pacquiao can shock. On 6 December 2008 he stepped up two weight divisions to take on the decorated American Oscar de la Hoya at the MGM Grand and physically dismantled his opponent, punishing blow by punishing blow. "Never in my wildest dreams did I think Manny Pacquiao would be the fighter he was that night," said De La Hoya, who retired after round eight. "He never stopped throwing punches. That win catapulted him to new heights." Floyd Mayweather is getting his hands wrapped in his dressing room and as no stone goes unturned, Manny Pacquiao's trainer Freddie Roach is stood, glaring at the process right next to him. Roach points something out to an official overseeing the procedure. Roach knows all about Mayweather and has trained fighters to face him in the past. No detail will be missed here, there is just too much on the line. How are you guys feeling? This six-year wait is nearly over. Butterflies yet? It's hardly top secret that Amir Khan wants a shot at Floyd Mayweather. The titles, the pay day, the glitz and glamour, what fighter wouldn't? The Bolton fighter is ringside tonight and while boxing records are broken before his very eyes, he is instead shaping up to meet American Chris Algieri - a man Pacquiao knocked down six times last time out - in four weeks. "Pacquiao is hungrier for the fight as he knows what this fight holds for him," Khan told BBC Sport. "I think it will be a 50-50 fight in the first few rounds but then Mayweather may edge forward with his experience and confidence and take the next six rounds to win the fight. "I want to fight Mayweather. The reason why is Manny Pacquiao and I are friends, we used to train together. Also, Mayweather is an unbeaten fighter and I want to give him his first loss." Ben Weaver: I made it! He didn't! Come on. BBC Radio 5 live now. You can listen through the coverage tab at the top of this page and tune in on the BBC Radio 5 live website. "The anticipation for Mayweather v Pacquiao is understandable. After all, these are two of the greatest pound-for-pound fighters of their era - one undefeated; the other a champion of six weight divisions. Something has to give. And few sports can match boxing for sheer fervour when it comes to fight-nights such as this. "And yet, despite the barely believable numbers being generated here, they are also perhaps symbolic of a sport that has sold its soul and lost its way...."
'Why riches alone can't revive boxing' on the BBC Sport website. "Money isn't everything, money is the only thing," Floyd Mayweather once said. He lives up to the motto, earning $105m (£69m) last year to become the planet's best-paid sportsman. His estimated wealth is around $295m (£193m). That's more than the annual output of two Pacific Islands - Tuvalu ($38m, pictured) and Kiribati ($172m) - combined. As for Pacquiao, he must live off beans, low-cost fizzy drinks and travel using public transport with his estimated worth at only $110m (£71.2m). More Hollywood royalty in the house in the shape of Jake Gyllenhaal as the 16,500 -eat MGM Grand begins to fill up. The final fight ahead of the main event has just started and WBC super bantamweight world champion Leo Santa Cruz has enjoyed a good first round against Jose Cayetano. If this one goes the distance then we can expect Mayweather-Pacquiao in around an hour or so. No need to wait too long for BBC Radio 5 live coverage now though. It kicks off at 03:30 BST. Who would you never want to fight? Patrick Sopp: Sonny Bill Williams - because he's a rugby player AND a boxer. And he's enormous (pictured). Lan Lee: Definitely not interested in getting in the ring opposite Gennaro Gattuso. If life takes you from a cardboard shack, to your national congress and a vast net worth, being an underdog may well not seem too daunting. the feeling of the killer instinct and the focus that I had years ago is back," said Manny Pacquiao this week. "I haven't felt like this in my recent few fights, but now I feel different. I'm eager to show something, especially because I'm the underdog." Back-to-back defeats to Timothy Bradley and at the hands of a vicious Juan Manuel Marquez knockout months later in 2012 (bottom picture) somewhat blotted Pacquiao's copy book. He has won three times since. Kasirye Sseruwagi Ronald: To beat Mayweather, you must have fast hands, the quick feet to get the hands there, and the attitude of a volume puncher. #Manny #pacman has all those attributes. Anyone can pay to use Freddie Roach's Wildcard Gym in Hollywood if they part with $5 a day and if the 55-year-old trainer had charged media in this last few weeks, the scrum would have produced some juicy takings. One customer is a bit special to Roach though. His relationship with Pacquiao has been described as father-like by the fighter himself. On a recent trip to the Philippines Roach was watching Pacquiao play basketball when someone asked him if he was still the father figure. "I think we are just friends," Roach replied. "How come every time Manny shoots a basket he looks at you?" Roach was asked. Roach observed and sure enough, every successful basket was followed by a look from the man who has spent the last three months firing punches his way. "You're still his father figure," Roach was told. Floyd Mayweather will have his father Floyd Snr in charge in his corner but the pair have not always enjoyed a good father-son or professional relationship. Floyd Jnr has been guided by his uncle Roger in his corner for the vast majority of his professional fights. Contrast that with the continuity across the ring. "I go to bed thinking about the fight, I wake up thinking about the fight, I need him to fight a perfect fight," said Freddie Roach of his long-term charge. Manny Pacquiao draws a crowd even when he goes for an early morning run. Forrest Gump in the 1994 classic film, Pac Man is followed from his Hollywood home each morning by scores of fans who want to join him on a jaunt. In the gym though, he has been in lockdown, and according to the boxing rumour mill at least, the Philippine slugger arrived at training camp with a strategy to beat Mayweather. Why is this perhaps noteworthy? In all of their fights as a team to date, trainer Freddie Roach says Pacquiao has never watched a video of an opponent or suggested anything. "The boys are here - Manny with family and friends and Floyd with bodyguards. Filling up, odd atmosphere - it's all about one fight, two men." You can listen to Steve as part of BBC Radio 5 live's commentary from 03:30 BST. Aside from flying on his own planes, picking which of his fleet of luxury sports cars to drive or mulling over which pair of sunglasses to use from his lavish collection, Floyd Mayweather puts some hard yards in. At the Mayweather Boxing Club in south Las Vegas, the 38-year-old has been living on a diet of over 1,000 punches a day, 700 sit ups and around seven miles of running (or as boxers like to call it 'road work') each day. 'Money Man' - known for keeping bizarre hours - has also been freezing his body in a Cryotherapy chamber to heal muscles, turning up for the treatment at 3am on some occasions. now part of Floyd Mayweather's staff. Hollywood is in Las Vegas tonight. Well, some of its well-known names at least. Actors Clint Eastwood, Don Cheadle and Jon Voight are dodging microphones as eager media seek their views on who wins this one. Ben Dirs: "Manny and Floyd are in the building. The MGM Grand Garden Arena pretty sparsely filled as Lomachenko goes through his paces in near silence." Vasyl Lomachenko comfortably defended his WBO Featherweight crown with a stoppage of Gamalier Rodriguez in the ninth round. It was dominant to say the least. "The frenzy continued earlier in the race and sportsbook area, which I walked through in this MGM Grand Hotel, which is basically an open area betting shop within the casino. the Kentucky Derby, the New York Yankees against the Boston Red Sox in baseball, the NFL draft continues and it's all building up to the fight." British bookmakers have Mayweather as 1-2 favourite; Pacquiao at 2-1 and the draw rated a 14-1 chance. You can listen to Mike commentate on the fight live at 03:30 BST on BBC Radio 5 live. Where are you following the action? James: Watching it with a ginger cat. Eyes wide open, no going to bed for that one. In a fight of contrasts, one similarity is the difficult start to life both Manny Pacquiao and Floyd Mayweather had. Pacquiao hails from the southern most point of the Philippines - General Santos City - an area once known as the 'Tuna Capital' of the country for its fishing opportunities. But Pacquiao's early life there was far from one of opulence as he shared a shack with his family, scrounged for food, at one point sold donuts and eventually found boxing, where he earned $2 a fight in the early days. Mayweather entered the sport with a far firmer platform. His 1996 Olympic bronze medal saw him turn professional and earn $25,000 for his first professional fight. The American was 19 at the time and became a millionaire by 21. That though is only part of the story. 'Money' grew up in a troubled home in Grand Rapids, Michigan. His mum took drugs, his dad at one point sold them and went to prison. Floyd Mayweather is probably in his dressing room as Manny Pacquiao enters the MGM Grand. Television cameras are held on high to catch a glimpse, he walks arm in arm with his wife Jinkee as a huge entourage follow behind. Such is the mass of people with him, he can't make the swift progress Mayweather did through the corridors. It's a longer procession but as he has been for much of fight week, Pac Man is smiling. Blue tracksuit bottoms, red hoody. Comfortable clothing the order of the day for the six-weight world champion. Some Philippines residents may have to choose between a cold beer and the fight this morning. Such is the fanatical support in the country for Manny Pacquiao, a power cut is likely in some areas around fight time due to a surge in television usage. asked for around 15,000 people to turn their fridges off and requested others refrain from using washing machines or air conditioning until the fight is over. A knockout it needs to be then Manny. The chores cannot wait forever. Manny Pacquiao: Tonight's gear for the fight. The eyes of the Philippines will be transfixed on their national hero. Millennium Falcon or a pair of socks from Aunty Janet?" Floyd Mayweather is in the MGM Grand. Elvis is in the building. Flanked by some of the biggest security guards you ever will see (I'm talking man mountains), he saunters through corridors in a black tracksuit with a white peak cap on his head. As always, he is a walking advert for his 'The Money Team' brand. He looks past the television cameras, there are thoughts rolling through that mind behind those eyes. What do you think? Fear? Nerves? Excitement? How heavy does an unbeaten 47 fight record weight on those swaggering shoulders? - Negotiations for this super fight began in 2009 with an even 50-50 split of money agreed only for Manny Pacquiao to turn down Floyd Mayweather's demand for random blood testing right up to the fight. - In 2012, Pacquiao agreed to random blood testing but was offered just a flat $40m, a sum his camp rejected. - With talks going well by January 2015, Pacquiao had a flight cancelled from Miami and attended a basketball game, not knowing Mayweather was in attendance. The pair spoke and in the early hours of the morning met at Pacquiao's hotel. Within weeks, Mayweather tweeted an image of the signed agreement. That's the short version of events. Throw in some defeats for Pac Man, TV companies needing to work together, promoters arguing, lash the kitchen sink in there while you're at it and this fight was no easy deal. Also let us know who you think will win and finally, tell us which sports star would you never want to get in a ring with and why? I'll go for Roy Keane. Why? Because he's Roy Keane. Former three-weight world champion Shane Mosley: "Floyd Mayweather is going to win the fight because of his intelligence and the way he moves in the ring. He has great movement where he can make it very difficult for Pacquiao to get shots off." WBA super-middleweight champion Carl Froch: "Mayweather will put on a defensive masterclass, behind the shoulder, slipping and sliding, ducking and diving and not getting hit. He's a defensive genius, a magician in the ring. But Pacquiao should punch the shoulder, punch the arms, hit him round the back of the head, in the kidneys, take anything he can. I'm going for a close Mayweather points win." Former middleweight and light-heavyweight champion Bernard Hopkins: "There is no fighter in the last five years that Floyd Mayweather has fought that had the speed and hands that Pacquiao has. Mayweather will have to deal with that. I believe he will but it won't be easy." Who's your pick to win? A humble man tries to topple a showman. A man adored by his people attempts to upset an opponent who divides opinion in his own country. This is a tale of contrast, brought together by hundreds of millions of dollars and public clamour. Behind the eyes of both men thoughts turn over - an intricate plot of how to ensure the other's demise. But planning the ending to this story and carrying it out are two very different tasks. Mayweather stands imperious, undefeated, a defensive freak in the sport who has bounced his way past great names. Pacquiao knows the pain of defeat but has risen through boxing's weight divisions, showing is adaptability and durability alongside his ferocious speed. pay £94,000 for a ticket then? Fear not, this live text will build-up to the big one, commentate through every round, produce stats you'll impress your mates with and round-up all the quotes and reaction in the hours that follow. will be live from the MGM Grand in Las Vegas from 03:30 BST. Anyone had a family member who barely acknowledges sport exists pipe up about Floyd Mayweather v Manny Pacquiao this week? The public demand for this bout has rained in like blows to a boxer trapped in a corner. Two men, 111 fights between them, world titles in a combined 11 weight categories and who, in the public's eyes at least, were always destined to meet. Over the coming hours, the eyes of a watching world will be centred on one ring and 12 possible rounds. a showdown to define a generation. The list of tag lines for this event runs as long as the Las Vegas strip. But cast them all aside for a moment, even the men set to light up the ring have said this one is for the fans.